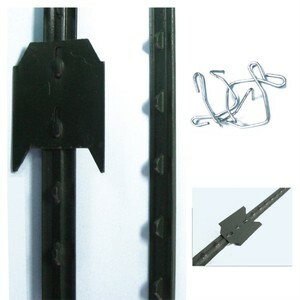 1.33LB/FT, 1.25LB/FT, Galvanized Studded T Post With Clips Material: high quality Q235 steel rail and billet steel. 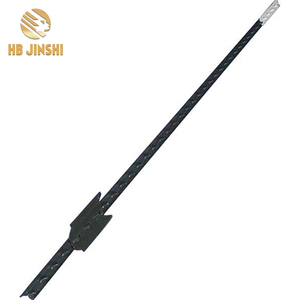 Surface treatment: black bitumen, painted, non-painted, hot-dipped galvanized Packing: 10-20 pcs/bundle, 20bundles/pallet Specifications: Measurement Length (feet) 5 5.5 6 6.5 7 8 Specification PCS/MT PCS/MT PCS/MT PCS/MT PCS/MT PCS/MT 0.95lb/feet 424 389 359 333 311 274 1.25lb/feet 330 301 277 257 240 211 1.33lb/feet 311 284 262 242 226 199 We also can produce post clips, post driver for you. 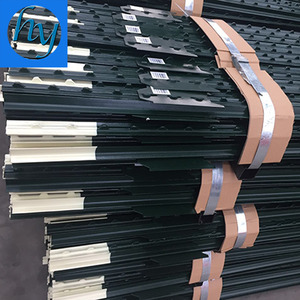 T fence post Fence Post Studded T Post (USA Type) U Post (USA Type) Star Picket (Australia) Y Post (Middle East) T Post (Euro and Canada) T Fence Post(American Type) Assortments available: - Punched, with spade or without spade - reen painted or brown painted Specifications Available Light Duty 0.86LBS/FT 5' 6' 7' Light Duty 0.95LBS/FT 5' 6' 7' Regular Duty 1.10LBS/FT 5' 6' 7' 8' 9' Heavy Duty 1.33LBS/FT 5' 6' 7' 8' 9' Fence post We can supply various kind post suit for the fence , Use the high quality steel and galvanized or painted to colors . Type and color can be required by client . 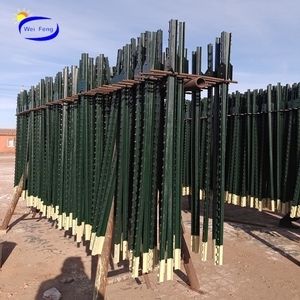 Name: Studded metal T post Product Studded T post Type No paint no spade, with paint no spade, with paint and spade Length 4&rsquo; ,5&rsquo;,6&rsquo; ,7&rsquo; ,8&rsquo; ,9&rsquo; ,10&rsquo; ,11&rsquo;,12&rsquo; or as per customer's requirements Size (LBS/FT) 0.83, 0.85, 0.95, 1.15,1.25,1.33 or as per customer's requirements Packaging 5 PCS/bundle,400 PCS/ pallet MOQ 5 tons Production Capability 1000 Tons/Month Delivery Time Within 30 days after order confirmation Payment Terms L/C at sight or T/T Certification BV, TUV, SGS, ISO9001, ISO14001 Workshop Our Customers Why Choose us 1.20 years exporting experience 2.Member of China Packing Association and China Plastics Processing Industry Association 3 High capa. 500mt/day 4.Biggest fabric width 6m/8m,film 20m 5.ISO,TUV, BV and SGS certified 6.Achieved national patent and with Chinese/American trademark 7.Annually attending exhibitions. 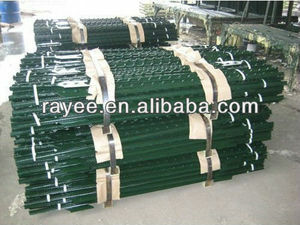 We started to manufacture PP and PE woven goods from1993. Our team will work closely with you every step of the way to deliver high quality products with competitive pricing in a timely manner. 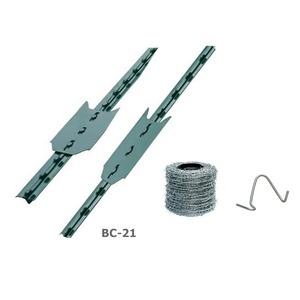 This T-Post topper comes with an insulator built in so you can run one strand of 2" tape or up to 3/8" rope across the top to further limit contact with the fence . 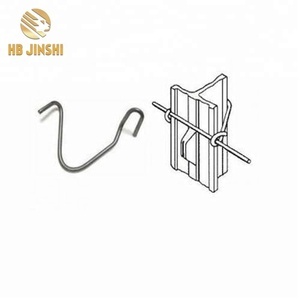 The CAP&rsquo;R Insulator is designed to either nail onto the top of a wood post or fit onto a steel t-post. ), if they have not, the customers should pay us the money via bank transfer or western union, thus we pay the postage for them. Alibaba.com offers 248,293 t post products. About 2% of these are fencing, trellis & gates, 1% are silver jewelry, and 1% are other sports & entertainment products. 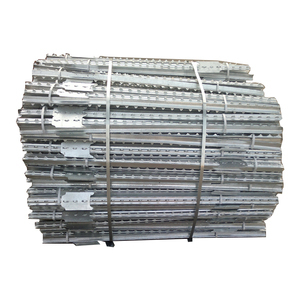 A wide variety of t post options are available to you, such as free samples, paid samples. 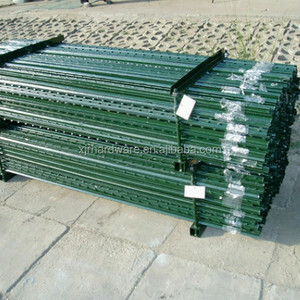 There are 248,293 t post suppliers, mainly located in Asia. The top supplying country is China (Mainland), which supply 100% of t post respectively. 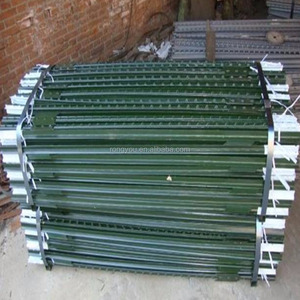 T post products are most popular in North America, Western Europe, and Northern Europe. You can ensure product safety by selecting from certified suppliers, including 16,391 with Other, 10,313 with ISO9001, and 1,937 with ISO14001 certification.